Stansted Airport wants to increase the number of passengers it is allowed to handle each year by eight million. It expects to reach its current cap of 35 million within five years and has applied for planning permission to raise it to 43 million. The Essex airport said it could be done by making better use of runway capacity without breaking caps on flight numbers or aircraft noise. Chief executive Ken O'Toole believes it would create an extra 5,000 jobs. He said: "Stansted will be the fastest growing airport in London in 2018. "Our competitors in London are capacity-constrained and they're finding it very difficult to provide additional capacity for airlines that want to grow and serve the South East. "Airlines will recognise that Stansted is the only major airport in London with available capacity probably for the next 10 to 15 years. "London demand will not go away. It will continue to grow and that puts us in a very strong position." Heathrow Airport hopes to start building its third runway in 2021 at a cost of £14bn. The Department for Transport previously said no expansion would mean London's five airports reach full capacity by 2034. Some 26 million people travelled through Stansted last year and the new limit, if approved, would put it just behind the UK's second busiest airport, Gatwick, which handled 45.6 million passengers in 2017. 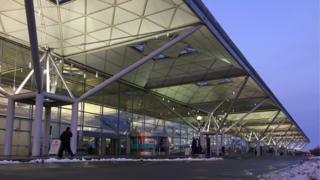 It is part of a five-year, £600m construction project to expand passenger facilities at Stansted. The airport's 190 routes will be expanded this year to include New York, Toronto and Dubai. Mr O'Toole said he is "confident" that Uttlesford District Council will approve the planning application submitted on Thursday.